Following our stay at Xakanaxa we were again to hop onto the Cessna and make our way to the Chobe national park. We quickly learned that it was 3 flights this time to our final destination. 15, 20 and 40 minutes. Fun fun. Things started great and I was enjoying the elephant viewing from above. Take off, landing, take off, landing, take off…ok…can we get there already? In my infinite wisdom I started watching some ‘Scrubs’ on my ipod on the last flight…I get deathly sick. You see…I get really bad motion sickness and these Cessnas, well, they move a lot in the air. I spend the next 30 minutes trying not to throw up on the people in front of me. Focus on the horizon…that was a big bump…i wonder if anyone else is sick…I’m not moving to find out…stay still and it will be over soon. I made it without seeing breakfast, but this was not fun. Our arrival at Xakanaxa presented us with a nice reception from Flo, the usual arrival drink, apple juice this time, and the awareness that at night we are not to go walking around alone due to hippo danger…sweet. A lunch of meat loaf was delicious and my upset belly was not enough to keep me from housing this plate of food. We were showed the fully stocked bar and coolers that are self-service and all we could drink…could you repeat that?…all we can drink. Deal. 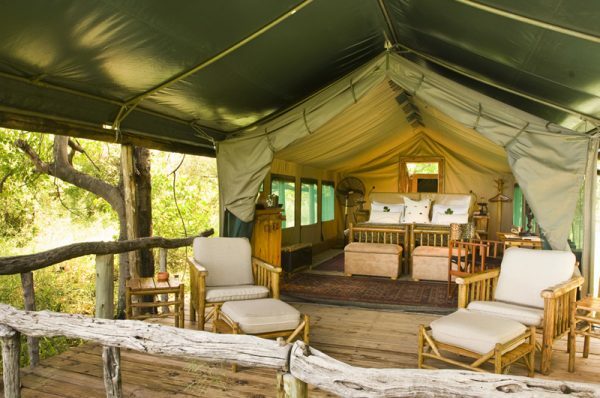 We are taken to our tents which are basically awesome big tents with hardwood flooring and king size beds. The picture gives you a better idea than I could ever paint for you. I’m very happy. Our stay at Xakanaxa would be filled with morning and evening game drives, about 4 hours each and midday break to have some food and relax by the pool. I believe I was one of the few to enjoy the pool time. The drink coolers were great. The food was always amazing. The other guests and staff turned out to be always friendly and full of great stories. This is the place to go if you want to interact with people who have great stories and are from all around the world. The animals we saw were what you’d expect and was more natural than say Etosha. We had nightly visits from hippos around our tents. Elephants would invade the campsite despite the electric fences. It’s a wild place and you are reminded all the time…it’s great. Go here if you can. Next stop was Chobe national park. Ok…Botswana. After spending a long week of driving in Namibia we made our way back to Windhoek for a flight out to Botswana. Our destination…Johannesburg. No, Johannesburg is not in Botswana, but we had to make a pit stop there in order to fly to Maun, Botswana. Our plane was a wonderfully old MD-90 with no discernible markings to indicate that this was an accredited airline. Air Botswana…mkay. I had to keep telling myself that flying is safer than driving and no place is more dangerous to drive than in Africa. I am not aware of numbers on flight safety in Africa and would rather not know. We make it to Maun without incident and as luck would have it, another flight. 🙂 This time we’re in a single-engine, eight-seater Cessna. A 15 minute flight to get us to Xakanaxa. This was also quick and painless and was actually pretty cool flying so low above the Okavanga Delta. The landing was thrilling and we arrived to a group of people waiting with safari vehicles to take all passengers to their respective lodges…can we get some lunch? Currently at the Garden Route Game Lodge after leaving Franschoek this morning. The wine country was amazing and definitely worth a visit when, not if, you make the trek to Cape Town. Things are going well and definitely not getting enough rest, but figure I’ll live. Not many details right now, but I’ll see what I can do once it’s all said and done….have to leave some writing for while I’m on the airplane. I did have my first rain fall in 6 months today so that was interesting to experience again. It’s also really cold here so I guess it’s a good warm up for heading back to a Cincinnati Fall. I arrived safely in Cape Town yesterday after leaving my parents in Zambia for their own travels back to the U.S. I’m now on my last adventure in Africa and will be heading home after 10 days of fun with my friends Todd and Andy. Honestly I kind of feel like I need a break, but I can always rest when I get back home on the 21st. More details to come. Dad and I went for a great rafting trip down the Zambezi river the other day. This is a must for any adventure seeking person who happens to make the trip to Victoria Falls. Plenty of class five rapids to be enjoyed. Names like Stairway to Heaven, The Temple of Doom and Commercial Suicide have been given to the rapids clearly to make those who face them feel at ease about what they are about go through. We were successful on the day with no falling out of the boat and no flipping over. We swam in crocodile infested waters…not joking. All in all this was a great day. Only sorry that mom couldn’t go, but with the hike in an out of the canyon it is best that she didn’t. Our half day trip ended with a hike out of the canyon, but in reality it was more of a climb. I had to frequently look back to check on dad who I thought was having a heart attack at one point. The guide warned us and said that the record time to the top was 6 minutes and the other was an hour and half…took us about 10 minutes. The top we were greeted by cool drinks and a short bus ride back to the hotel. Good times. I’m now a billionaire…so that’s cool. Part of our trip we decided to walk into Zimbabwe to check out Victoria Falls and also to see the Victoria Falls Hotel. This decision was an excellent one. It all started with us walking out of Zambia, crossing the bridge and entering Zimbabwe. We were bombarded by people trying to sell us things. One of the main things they were selling was the now defunct Zimbabwean currency. I can now say that I’m a Zimbabwean billionaire as I have in my possession a few 100 Billion Dollar notes. Immigration was fun. We got stuck behind a Japanese tour group of about 50 when normally there is no line at all. Hot is an understatement of how it was in the office. We finally got through though with the help of a nice agent and paying our $30 visa charges. Next stop was Victoria Falls park. $20 dollars per person later we were seeing some awesome sights of the falls. Since we couldn’t see anything from the Zambian side this time of year this was necessary to see the falls and who would go to Victoria Falls and not see the falls? Pictures and videos to be shared soon. What else…we then went to the Victoria Falls Hotel. It’s from the early 1900s and is an amazing place to see. I recommend this. Mom and I were attacked by some vervet monkeys that thought my sun glasses were food and when they realized they were they got pissed. I did my best monkey intimidation grunt and readied by water bottle for maximum dousing. Danger was averted. We made our way back into Zambia as the sun fell. Mom and Dad did their best power walking impression as they were a bit nervous of some of the locals. I laughed a bit, but it’s understandable as it takes a bit of getting used to here. Dad also had a dual holster of camera equipment going on so he looked like a pretty good target. A couple of mishaps on the trip so far. I left my passport in the safe in the hotel in Joburg. We were almost at the airport when I remembered…I’m smart. Fortunately a few things were on my side. I remembered the combination I used to the safe. I remembered my room number. The tour operator had a driver they could send to pick it up. Lastly, the flight was much later than we thought. I now have my passport and will not be losing it again. A couple days later we’re staying at the Xakanaxa camp in Botswana. This is in the middle of the Okavenga delta so it requires flights on small planes. We’re already half way through our 3 flight trip to get to the Chobe National park when Dad realizes his own misstep. Passport holder and cash are on the night stand in their tent. Oops. We again have dodged a bullet and the passport was able to be delivered a day later. Sometimes the tree inherits aspects of the fallen acorn. Time has been limited and so has my Internet connectivity. I promise I’ll write at length when all is said and done, but the Namibian adventure has come to an end. I’m currently sitting in Johannesburg in the Michelangelo. I decided to pass on the tour today as I’ve not been feeling the best and considering I’ve driven over 1500km within the past week I think I need a rest. I’d like to point out some highlights from our trip so far with, again, more details to come later. – Saw a herd of 35 elephants in Etosha…saw a lion, some hyenas as well as new comers to animals I’ve seen. Not a very detailed list, but some highlights that I will elaborate on later.